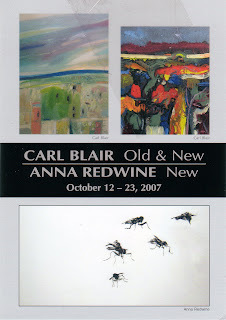 if ART presents Old & New: Carl Blair and Anna Redwine at Gallery 80808/Vista Studios, 808 Lady Street in Columbia’s downtown Vista from Friday, October 12 through Tuesday, October 23, 2007. A reception will be held on Friday, October 12 from 5 – 10 PM. Additional gallery hours are: Weekdays from 11 AM until 7 PM; Saturday, from 11 AM until 5 PM; and Sunday from 1 until 5 PM. When visiting Gallery 80808, free parking after 6 PM is available in the city owned lot diagonally across Lady Street…but entrance to the lot is off Washington Street. Carl Blair has been on many levels a driving force in the arts since he came to South Carolina in 1957. He’s one of the state’s most prominent painters. He was a leading force in making Bob Jones University’s art department a central part of the Upstate South Carolina art scene. He is among the founders and owners of one of the state’s oldest art galleries. He’s been on scores of local and statewide boards and commissions. And he’s been a mentor to students and friend to many colleagues, providing both moral and practical support for more than a few. In 2005 he won for Lifetime Achievement the Elizabeth O’Neill Verner Award, South Carolina’s Governor’s Award for the Arts. As co-founder, part owner and president of one of the state’s oldest and most prominent galleries, Hampton III in Taylors, just outside of Greenville, Blair from the early 1970s helped provide an early outlet for contemporary art in the state. Hampton III’s importance cannot be overstated. In addition to Halsey, McCallum and Bardin, the gallery from the start provided representation for Leo Twiggs, Jeanet Dreskin, Bette Lee Coburn, Tom Flowers, John Acorn, Darell Koons, Emery Bopp and others, many of whom were leading contemporary South Carolina artists. The gallery also tapped into subsequent generations as it exhibited work by Philip Whitley, Edward Rice, Bob Chance, Alice Munn, Jim Craft, Jeri Burdick, David Yaghjian, Janusz Zadurowicz, Dave Appleman and many others. In recent years, Hampton III has organized landmark exhibitions of works by Halsey and Edmund Yaghjian that helped establish new price levels and recognition for those deceased icons of post-war South Carolina art. The gallery also reintroduced veteran artists such as Sigmund Abeles, Charles Quest and Alta Alberga. Blair played a crucial role in all this. Between Hampton III and BJU, he has, by his estimate, hung more than 1,500 exhibitions. Statewide, too, Blair helped promote and steer the development of the arts. He held office in the legendary Guild of South Carolina Artists, which served visual artists from 1950 through the 1980s, especially with its annual statewide exhibitions. In 1968 he was appointed to Greenville’s Arts in Public Places Commission. He served on the acquisition committee of the S.C. Arts Commission from 1969-1972. In 1987, the governor of South Carolina appointed Blair to his first three-year term on the S.C. Arts Commission Board of Directors. He was reappointed in 1990 and 1993 and elected chairman of the board in 1994 and 1996. Blair also sprung into action in 1989 when Hurricane Hugo wrecked coastal South Carolina, organizing an effective fundraising campaign for artists affected by the storm. Blair was born in 1932 in Kansas, where he grew up on a farm and, by his own account, “dreamed a lot… I spent a lot of time in the woods, got to know trees and plants and atmosphere, the effect of the sun and light… I took everything in, stored those impressions up.” In 1956, he received a BFA from the University of Kansas; the next year, he earned an MFA from the Kansas City Art Institute and School of Design. He married Margaret Ruble, and the couple, also in 1957, moved to Greenville, where Blair joined the art faculty at BJU. Soon after their arrival in Greenville, Blair began teaching at the Greenville Museum, too. In the 1960s he also taught several years at the Kansas City Art Institute’s summer school. In the late 1950s and early 1960s, Blair began his long involvement with the Guild of South Carolina Artists, entering work in its annual art competition and starting the string of awards he would receive from that organization. He frequently began to collect awards from other statewide, regional and national competitions, too, receiving a good hundred altogether. Critics were impressed with the technical ability Blair demonstrated in his abstracted landscapes. University of Georgia art professor A. Graham Collier called him “a lyrical poet.” One judge, Louis Bosa, chair of the advanced painting department at the Cleveland Institute of Art, selected Blair for a top award because “the artist had captured the most strange mood of nature” the judge had seen for some time. Blair’s entry, Bosa wrote, captured “the feeling of wind blowing, as well as almost the growth of nature.” The art competitions took Blair’s work to venues such as Atlanta’s High Museum, the Isaac Delgado Museum in New Orleans, the Montgomery Museum of Art in Alabama, Florida’s Ringling Museum of Art, the Mint Museum in Charlotte, the Tuskegee Institute in Alabama, Clemson University and, in his home state, the Greenville Museum, the Gibbes Museum in Charleston and the Columbia Museum of Art. In 1962, Blair was invited to join the Joanne Scott Gallery in Norfolk, Va. Six years later, the Bertha Schaefer Gallery in New York City followed. He was included in Prize Winning Art Book Six in 1966 and in Paris, France’s Le Revue Modern in 1965 and 1968. In 1969, Blair also was part of the first major survey of visual arts in South Carolina, the “1st S.C. State Invitational” at the Columbia Museum of Art. That same year, he was included in Jack Morris’ book Contemporary Artists of South Carolina, published by the Greenville Museum. Two years later, Blair was invited to “Six South Carolina Painters,” an invitational at Clemson University, and to an exhibition of art from ten Southeastern states at Georgia College at Milledgeville, juried by Elaine De Kooning. Also in 1971, Blair became president of the Greenville Artists Guild. The next year he was the first person to receive the “Annual Director’s Award” from the Greenville Museum. In 1972, with Emery Bopp, Darell Koons, and Richard Rupp, he founded Hampton III. Blair kept up a busy exhibition schedule throughout the 1970s and 1980s. His reach extended well beyond the Southeast. One of his paintings was in the 1984 group exhibition “Portrait of the South” at the Palazzo Venesia Museum in Rome, Italy. Blair had his first major solo museum exhibition in 1982, at North Carolina’s Asheville Museum of Art. He participated in several in-state museum exhibitions. In addition to solo gallery exhibitions at Erskine College in South Carolina and his own Hampton III Gallery, Blair had one-man shows in Atchison, Kan., Scottsdale, Ariz., and, repeatedly, at the Jerald Melberg Gallery in Charlotte, N.C. Throughout the 1990s and after, Blair kept up his torrid exhibition pace at museums, institutional venues and commercial galleries, including Melberg, Hampton III and galleries in Columbia, Charleston, Atlanta, Kansas City, Mo., Cincinnati and Cleveland, Ohio, and Vero Beach, Fla. He also showed at Blue Spiral I in Asheville, N.C., the Morris Museum of Art in Augusta, Ga., and the Las Vegas Art Museum. Blair’s work was part of the U.S. State Department’s Art in the Embassies program, in Egypt and Mauritania. In 1994, Blair was invited to the S.C. State Museum’s “Centennial Celebration Exhibition.” Blair’s work is in more then 2,500 private, corporate and public collections. In January 2005, yet another solo exhibition closed at the Spartanburg (S.C.) Museum of Art just after a show of five prominent, historic South Carolina artists, including Blair, opened at the Greenville Museum. Blair also had solo exhibitions at Lewis & Clark Gallery in Columbia and at the Fine Arts Center of Kershaw County in Camden, S.C.